I think the author has brilliantly made his point regarding the possible dangers related to the convenient and over simplified use of VK by parties with vested interests, particularly the politicians and certain scholars. I would however, be cautious about calling the religious preachers’ use of it as a hoax also because it could result in denying the quote its intrinsic spiritual value as declared in the Mahopanishad. Moreover, I feel, it would deprive the quote of the only legitimate domain where its deeper implication is genuinely valid. Equating religious/spiritual use of VK to its ‘worldly’ counterpart would amount to ignoring the true possibility of experiencing mankind’s underlying unity which is expressed therein and which is the hallmark of the Sanatana Dharma. Making sweeping generalizations about its ‘abuse’ could result in the fallacy of throwing the baby out with the bath water and therefore it could be considered wiser to apply one’s unbiased discrimination before passing absolute judgements in this regard or for that matter on anything pertaining to the Shastras. Other than this minor observation, the articles on VK have been very enlightening for me personally. 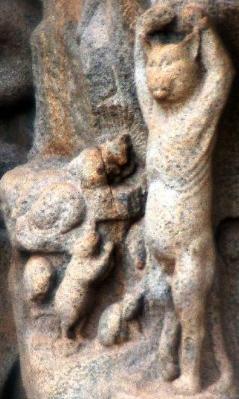 DhanyavAdah. Excellent work man. The quality of research you have done before writing such an article is simply outstanding. The author is a learned person and has conducted a nice research and I agree with his conclusion that the concept od ‘Vasudhaiva Kutumbakam’ is from Mahopanishad and is applicable to great men who have achieved Brahmi Sthiti or Atma Jnana. To see everything in the Atman and Atman in everything – that is the highest vision Vedanta promises to all human beings. The Gita teaching will be a great blessing to us in the modern age: ‘sarvatra samadarshanah’, one who sees equality everywhere. He or she is a human being, whether in possession of more money or less money, why concern ourselves with that? That is not the main value of a human being, there is the infinite Atman within each. This teaching must inspire our people to make us part from creed differences to true democracy in the socio-political field. A little bit of this ‘jnana’ of Brahman must come to us in the socio-political field. Then our democracy will be stronger and steady. But that insight has to come from inside and from one’s hard work, and not simply borrowed or believed because it’s written in a book or because it sounds wonderful. To simply believe in it at an intellectual level without self-realization of that truth seems a bit false, and probably not what the seers had in mind when they wrote it. The author has done a solid research on vasudhaiva kuTuMbakam! However, it is difficult to understand why he is calling it a hoax when Mahopanishad use it in the highest spiritual sense. That way all good quotes (tamaso mA jyotirgamaya…, satyameva jayate.., sarvetra sukhinA santu… etc. are liable to be misused, but we need not call them hoax. First composed probably during the rein of bhoja..
Sarvesh, spotted a tiny proof-reading mistake – should be “reign” and not “rein”. I didn’t see your email address here – please delete this comment – it’s just to inform you. Kaffir, thanks for the correction. You are akin to nArAyaNa paNDita, and we are akin to your disciples. I regularly visit this blog like a Gurukula. Your friend Manasa Taramgini is another great paNDita, though difficult to understand sometimes. All my difficulties are due to ignorance of saMskrtam, though I have a feel for it. To which veda is mahopanishad associated? Mystic Fire, apologize for delay. This is not tightly placed in any brAhmaNa and remains in the list of losely floating ones. I have read these essays many times, and these are a favourite of mine. Leftists have a theology called “Otherness” and the hatred of the Other. This is constantly used to characterize Hindu nationalists, and depict them as mirror-movements of Islamic fundamentalism. These essays are a profound counter to such narratives, apart from the warning they give to naive “Universalist” Hindus. IMHO, such essays are an excellent starting point to debunk the Otherness theologies. But more needs to be done to develop a significant body of literature of “Refutation of Otherness”. I am reading this long after you wrote it.Excellent research to put VK in perspective.Should br read by everyone today. I wonder why your are calling this a hoax. It is ofcourse misuse if one simply quotes “vasudhaiva kutumbakam”. But this quote when used in full…. udaara charitanatu… it makes sense. isnt it? For broad minded… the whole world is one family. Therefore our goal should be to make every one broad minded.. like us. Sarveshji, thank you for this complete, self standing analysis. It is of great use for my work of interfaith where we are surrounded by jackals masquerading as friends. Sarveshji it is good to get such in-depth research on the topic of VK. When this represented as a pyramid with the more basic needs at the bottom, self-actualization”, and “self-transcendence” comes at the apex which again coincides your observation with mahopaniShada. The same we can find in our Ashtang Yog’s eighth step of Samadhi. In today’s perspective where a research paper published by Oxfam, shows that the richest 80 person hold wealth more than other half of the world vk is only real concept for those 80 persons or at the most top 1% of the world. With all these four references it is proven that vk is not meant for average person in any way. VK is the territory of enlightened souls who completed other seven steps of Ashtang Yog or fulfilled all the basic needs up to the level of self-actualization in the pyramid of hierarchy of needs. 1)	There seems to be a mix-up between a family per se and the behaviour of (some) members of the family. Don’t brothers quarrel, fight and kill each other? Or sons kill parents? 2)	There seems to be a feeling that proclaiming, or better, seeing, all humanity as one family will unnerve one when it comes to man having to fight or kill man, but does the VK statement per se say so or even imply so? Mahabharata is internecine battle; here the ‘family’ feeling deters one from exercising the ‘fight and kill’ option right away, but does not by any stretch of imagination prohibit it. Don’t (perfectly noble) fathers or elder brothers (rightly) punish their children / brothers if need be? Haven’t noble monarchs executed traitors? 3)	The fish fable: True, the bigger gobble up the smaller, but aren’t the bigger and the smaller together yet really one family? 4)	The fables of Hitopadesh, Pancatantra, et al only caution us to be on our guard even with family members. 5)	There are many (other) passages in the Upanishads that convey ‘oneness’ as a preeminent theme, in fact the Ultimate Truth – a profounder ‘one family’. Don’t those passages in effect convey the same VK darshana — enlarged? 6)	In today’s world, can the time-worn, reductionist, philosophy of ‘you’ vs ‘I’, ‘yours’ vs ‘mine’ – built on selfishness – go on working without bringing the world to its knees? Aren’t giving, selfless service, ‘family feeling’, ‘brotherhood’ of man the key to a better future? 7)	All charitable statements from wheresoever by whomsoever can seem so — a hoax – if seen only in the context of the evil perpetrated, or possible to be perpetrated, in its name. I think, Sarveshji, you were only cautioning us to not get swept off our feet by the ‘family’ sentiment. Well, you are very right – to get so swept off our feet would be most irresponsible and may be suicidal in certain situations. Your article makes us consider every aspect of the question without bias. Cheers! Extremely well-written, researched and scholarly articles! I was intuitively of the same opinion as you, and now I have the full backing of Sanskrit literature. What many people in the comments still don’t seem to understand is that the VK principle is authentic only when it is an internal transformation of mindset of spiritual individuals. We should be personally generous within the safe zone of genuineness of individuals. But to make VK an operating principle at the level of society and nation is foolish indeed. If universal brotherhood were the ground reality, why bother maintaining police force, military and international boundaries at all? This is sheer idiocy. One of the grandest of Indian concepts is criticized for no sensible reason.